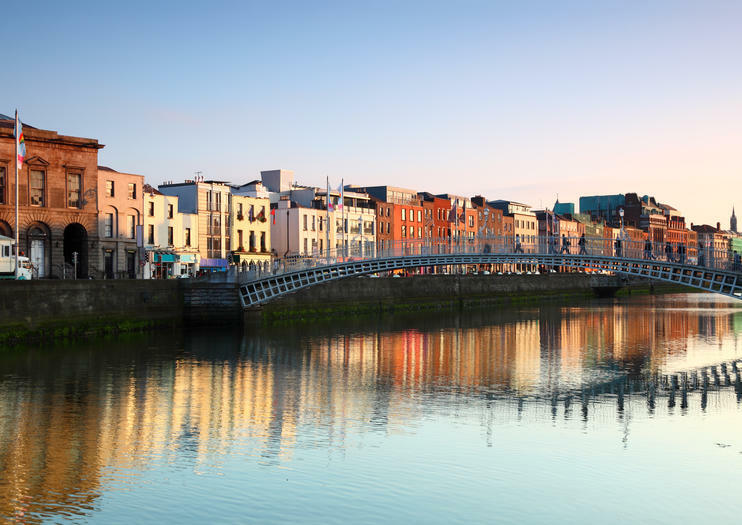 A must-see on any European trip, Dublin has much to offer travelers, from atmospheric pubs and vibrant streets once trod by literary superstars to historic landmarks and grand Georgian buildings. If you have three days to get to know the Irish capital, here are a few ways to best spend your time. If you want to get familiar with Dublin’s city center fast, choose a guided city walking tour. With someone who knows the city intimately at the helm, you’re sure to see all the top sights and glean historical information. Alternatively, save your feet from fatigue and opt for a hop-on hop-off bus tour with audio commentary instead. Either way, don’t miss Trinity College (your first stop should be the Old Library, which houses the centuries-old Book of Kells), Dublin Castle, the Great Irish Famine Memorial, Jeanie Johnston Tall Ship, and Croke Park, Ireland’s biggest stadium and the site of a museum dedicated to Gaelic games. After a day of sightseeing, unwind with a pub crawl around Temple Bar or a dinner show with live music, dancing, and traditional Irish fare. Leave Dublin behind for a day trip to one of Ireland’s most magnificent natural sites: the Cliffs of Moher. Travel by coach to the west coast, where you hike on coastal paths, explore Burren National Park, get a feel for rural life, and—if you’re lucky—hear some live traditional music in the village of Doolin. Another popular day trip destination is Northern Ireland. In just one day, you can explore Belfast and travel along the spectacular Antrim Coast, home to the UNESCO-listed Giant’s Causeway, Carrick-a-Rede Rope Bridge, and several Game of Thrones filming locations. Whichever trip choose, expect to be back in Dublin in time for a late dinner. Spend day three getting to know Dublin’s gastronomic scene, which has grown in the past decade or so. During a guided food tour of the city, get the inside scoop from a local on the most beloved cafes, pubs, food shops, and markets. Save room for a pint of stout, which you can enjoy at the 7th-floor Gravity Bar after touring the Guinness Storehouse. As evening falls, opt for a ghost walking tour and put yourself in the hands of a tour guide who shows you the city’s spookiest spots, from Kilmainham Gaol, the former jailhouse where many Irish nationalists were held before their execution, to cemeteries where everyone from criminals to celebrities are buried. Experience the beauty, history and culture of Dublin during this popular hop-on hop-off sightseeing tour. Choose from one or two day tickets and select one of two popular routes that highlight the best of the Emerald Isle. Discover historic buildings, iconic sites, ancient landmarks and vibrant nightlife at your own pace and enjoy free extras. With 28 stops along the way - including the Guinness Storehouse, the National Art Gallery, St Patrick's Cathedral and Old Jameson Distillery - this popular option ensures you don't miss a thing! Delve into the darker recesses of Dublin’s haunted history on this evening gravedigger ghost tour. With your (slightly spooky) local guide, learn about the devastating human effect of the medieval plague, visit eerie local sites such as Dublin castle and Kilmainham Jail, and hear how opportunist gravediggers made a killing (so to speak) on body snatching. Cap it off with a ‘ghoulish brew’ at Gravediggers Pub. Step behind the scenes of Ireland’s biggest and most famous sports stadium on this 2-hour guided tour of Croke Park in Dublin. Learn about the Irish tradition of Gaelic games as you discover the headquarters of the Gaelic Athletic Association (GAA) and try your hand at hurling and Gaelic football in the interactive museum. Then, enjoy a guided tour of the stadium; peek behind-the-scenes into the team dressing rooms and VIP area, and look out over the pitch from the stands. Eat like a true Dubliner on this 3-hour small-group Dublin food tour. With your guide, seek out authentic pubs, cafés, food shops, and markets, and savor Irish specialities including a traditional breakfast, artisanal cheeses, ice cream, and more. Pair your tastings with an Irish cream liqueur and another tipple, and admire some of Dublin’s hidden gems and learn about its culinary heritage as you eat and explore. Tour is limited to 12 or fewer.